Luxury Casino was established in 2011 and it holds a double gambling license, one from Malta Gaming Authority and one from the UK Gambling Commission. It is registered under the Casino Rewards group. The luxury look and feel of the website is obvious from the moment players first visit. The dark colored theme contributes to the glamorous design. The text on the banner and the main menu are rendered in a precious silver metal, which makes players think about the winnings they can make by playing at the casino. The diamond shape of the logo reinforces the exquisite status of the brand. The interface is opt imised to keep the same luxury feel even to the smallest screen. The navigation menu is simple, clean and easy to use both from desktop, tablet or mobile device versions. All the important information, such as sign up bonus, VIP treatment and casino games are the first elements that pop up after players take their first look at the interface. Each game category has a brief description. Potential players can see if the games are eligible for the wagering of the bonus, the betting ranges, the payouts and the titles available for the category. After they have read this information, they may proceed with the installation of the software or choose instant play with the Flash version of the casino. Microgaming is providing the software for Luxury Casino UK. More than 500 games from table games to slots and video poker are awaiting keen players. There are endless gambling opportunities, both for novice players or high rollers, as the bet limits are from 1 cent up to £25,000+, with a payout rate of 97%. At Luxury Casino UK players can play not only single and multi handed games, progressives but also multi level games of video poker. Several versions of blackjack and roulette as well as Caribbean Stud, Poker Pursuit, Craps, All Aces, Hold’em and Baccarat are to be found in the table games section. Three and five reel slots and the famous Immortal Romance and Thunderstruck II satisfy even the pickiest slot players. The welcome bonus is very generous: £1,000 on the first five deposits: 100% up to £150 for the first, 50% up to £200 for the second, 25% up to £300 for the third, 50% up to £200 for the fourth and 100% up to £150 for the fifth. 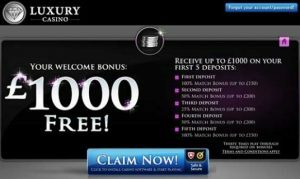 The minimum deposit for the granting of the bonus is £10 and it needs to be claimed within 7 days upon registration. The wagering requirements rise to 30x, with the 60x exception for the first deposit, but it applies only to the bonus money. A VIP program promises to treat all its players as celebrities from the moment they sign up. The casino experience is seamless for users of iOS, Android, Windows or Blackberry tablet or smartphone devices. Deposit and withdrawal is to be made with the classic methods: Bank Transfer, Visa, Debit and Credit Card, Paypal, Neteller, Skrill, PaySafeCard, InstaDebit, Ukash, EntroPay, ClickAndBuy, EZIPay, Kalibra, iDeal, Euteller, eKonto, Swedbank, Nordea and Moneta. The minimum amount players can withdraw is £50. If the winning a player exceed five times the sum of the initial deposit, he or she is limited to withdraw £4,000 a week. It is very easy to get in contact with the support team at Luxury Casino UK. The assistants are available 24 hours a day, 7 days a week on live chat, phone or e-mail. UK, Canada, Denmark and Germany have dedicated toll free lines, while international players have a separate charged line.